Habitat for Humanity of Morrison County is part of a global, nonprofit housing organization operated on Christian principles that seeks to put God’s love into action by building homes, communities and hope. Habitat for Humanity of Morrison County is dedicated to eliminating substandard housing locally and worldwide through constructing, rehabilitating and preserving homes; by advocating for fair and just housing policies; and by providing training and access to resources to help families improve their shelter conditions. Habitat for Humanity of Morrison County has an open-door policy: All who believe that everyone needs a decent, affordable place to live are welcome to help with the work, regardless of race, religion, age, gender, political views or any of the other distinctions that too often divide people. In short, Habitat welcomes volunteers and supporters from all backgrounds and also serves people in need of decent housing regardless of race or religion. As a matter of policy. Donate, volunteer and keep the ministry of Habitat for Humanity always in your prayers. Also participate in the International Day of Prayer and Action for Human Habitat, designed to put shelter on the hearts and minds of all people. ​Our success depends on local leadership, donations of building materials, land and financial contributions as well as time and talents, prayer and Divine blessings. Founded in Americus, Georgia, USA in 1976, Habitat for Humanity today operates around the globe and has helped build, renovate and repair homes for more than 750,000 families sheltering more than 3 million people worldwide. Habitat for Humanity International and its affiliated organizations (HFHI) will not proselytize. Nor will HFHI work with entities or individuals who insist on proselytizing as part of their work with HFHI. This means that HFH will not offer assistance on the expressed or implied condition that people must (i) either adhere to or convert to a particular faith, or (ii) listen and respond to messaging designed to induce conversion to a particular faith. 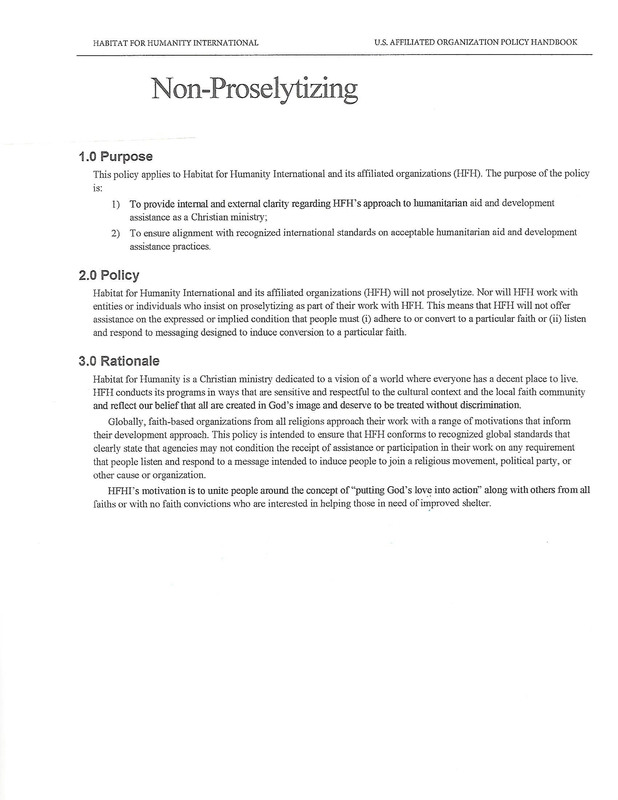 To view the full HFHI Non-Proselytizing Policy, click here. ​Habitat for Humanity of Morrison County Dedicates home for HFH homeowner, Stacy Anderson. ceremony was held on February 8, 2018. Homeownership Program, ​How to Apply: Applications for the Habitat Homeownership Program for affordable housing are currently closed. If you are interested in more information, please call 320-616-2084. In order to qualify for the partnership program, applicants must be currently living in Morrison County for at least one year, be low income according to household size, be willing to partner with Habitat in helping build their home and other Habitat projects, and have a housing need. Paying more than one third of one’s income for housing, overcrowding (three to a bedroom) unsafe or unsanitary conditions are some examples of housing need. ​30% - 60% of the average income for Morrison County. Please call the Habitat office with questions on qualifying income levels. A unique characteristic of Habitat for Humanity is that homeowners must help build their own home. In Morrison County, that means working a minimum of three hundred hours helping at the building site, the Habitat office, on fundraisers, or other approved community activities. People interested in applying, and who fit the above criteria are asked to contact Habitat for Humanity of Morrison County to request an application, 320-616-2084. Habitat for Humanity of Morrison County is a Christian-based nonprofit housing ministry and equal opportunity housing lender. Funds are raised and spent locally. Questions can be answered by calling 320-616-2084.